A picture circulating on Facebook has caught my attention. It was an image of a young Syrian woman, wearing a colorful head veil and raising her hand in front of a camera she defiantly looked at. The picture was circulated under the title, the “Friday of Dignity” for the refugees, meaning that it came in the context of the Syrian revolution. The Syrian regime that has oppressed its citizens for over four decades, never differentiated between men and women, and kept up with a pretense of preserving women’s rights. This was exactly like how its pretense of secularism and preservation of minorities’ rights are a lie that the regime has always known to use very well, and are until now its most important strengths, at least at the international level. This girl, obviously religiously conservative, has in this picture has gone far beyond the new and very serious threat facing Syria’s social fabric. By threats, I mean fundamental Islamic groups that threaten her very right to stare in the face of anyone. The girl in the picture is raising her hand at those who wish to have her married at an early age, denying her from her personal rights: the right to get an education, the right to work and earn financial independence with what that entails, and the right to choose the life she wants. Isn't it true, that we as liberals rush to label every veiled women as an Islamic. Isn’t it true that by doing that we’re being unfaithful to ourselves, to the principle of respecting the freedoms of choice and the freedoms of belief? This is then a personal revolution, even if this girl is joined with similar young women, brought up in conservative families that believe early marriage is a form of protection for women. This was until the country’s revolution came and destroyed numerous traditions, among which early marriage is just one. The uprising in Syria took women out of their houses, and unleashed a potential within them that even they never knew existed. Rim Halab, and that’s a pseudonym, is one of those girls. The 22-year-old who studied Islamic studies in high school, before going to college and completing a degree in Arabic literature (instead of Media studies as she dreamed of), is one of those who joined the revolution from its first days. She led demonstrations, and was one of the first citizen journalists that the world depended on to know what was happening inside Syria. As months passed she became a main source of information from Aleppo for some of the most established Arab news networks. She became famous under many names, she was Nour Halabi, and Um Laila, and Halab admin, and many more. Obviously, she was wanted by the regime, facing the charge of terrorism. She kept on demonstrating, got wounded and took two bullets in the shoulder. She continued her war against the regime. Just recently, she moved to a border town in Turkey and started a magazine and a radio station, through which she manages a growing team of mostly young men, including her younger brother, Farouk, her biggest ally. Rim, speaks passionately about women’s rights, she raises her voice, about the importance of women’s representation in elected councils. She also presents a radio show in the scope of which she profiles and interviews other women, a nurse, a lawyer, an activist, or an artist, who have played a leading role in the revolution. She doesn’t accept not to be in the frontlines, and she doesn’t see that her veil is an obstacle, even when she admits that on the ground there are growing threats facing the future of Syrian women, let alone the role they play in society. Despite that, Rim defends Islamists including Jabhet el Nusra. As far as she is concerned, they are the ones achieving something on the battleground and this is her first priority now. Furthermore, and maybe more importantly, she is still very capable of reaching out and negotiating with them. At least up till now. Today, Rim is closer to the radicals who threaten her future than she is to the secular liberals that in principle are supposed to be the biggest guarantee she stays in the lead. Geography is certainly an important element, Rim is still in direct and almost daily contact with her province, Aleppo, regardless of their backgrounds or their intentions, she sees her self in the same bunker with them. She shares their fate, while a tremendous gap separates her from those “selfish liberals sitting in Europe,” as she told me. Rim’s rhetoric about the liberals says plenty about plenty of what’s happening in Syria, between the cities and the suburbs, the rich and the poor, the inside and the outside, the liberated and the occupied, and so on. But above all, it raises a basic question to the liberals that even I couldn’t ask, not even to myself. Isn’t it true, that we as liberals rush to label every veiled women as an Islamic. Isn’t it true that by doing that we’re being unfaithful to ourselves, to the principle of respecting the freedoms of choice and the freedoms of belief? More importantly, isn’t it true, that by adopting this position, we’re giving up on a wide proportion, if not the majority of our societies, and without a fight? This is not about sociology, this is about politics. Islamic groups, starting with the Brotherhood, up to the al-Nusra Front, are fighting every day the battle of winning the hearts and minds of conservative communities, which up to this point have not made up their mind to choose political Islam. What are the supporters of the secular state doing in return? What’s their position vis-a-vis the veiled girl who claimed her right to wear what she wants, and to get an education, a job and a life? What’s their position vis-a-vis Rim’s veil? The veil of a Muslim girl who hasn’t chosen political Islam? Not yet. I tried to find the girl in the picture, but failed, just as I failed to kick out of my mind the idea that this girl deserves from me the same support I didn’t blink before giving to Amina, the Tunisian girl who wrote “my body is mine” on her naked body. From afar, the distance between the two girls can seem tremendous, but eventually, they both present the same challenge to us liberals. Alia Ibrahim is a Senior Correspondent with Al Arabiya News Channel. Since 2008, she has covered news from across the Middle East. Ibrahim has produced a number of documentaries and is currently writing a book about her impressions on the revolutions that have swept the Arab world. 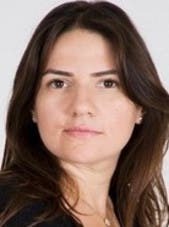 Ibrahim began her career in 1996 as a general news reporter at The Daily Star in Beirut and became its managing editor in 2004. Later, she moved to Dubai TV as their Beirut correspondent. She was also the Beirut-based correspondent for the New York-based Womensenews. She was a Special Correspondent for The Washington Post from 2005 till 2011. 846 Shares France asks: Should Notre-Dame’s spire be rebuilt as it was?